Pupils, parents and staff at Wrotham Road Primary School with Christmas collections and non-uniform days have raised £600 to help victims of disasters. 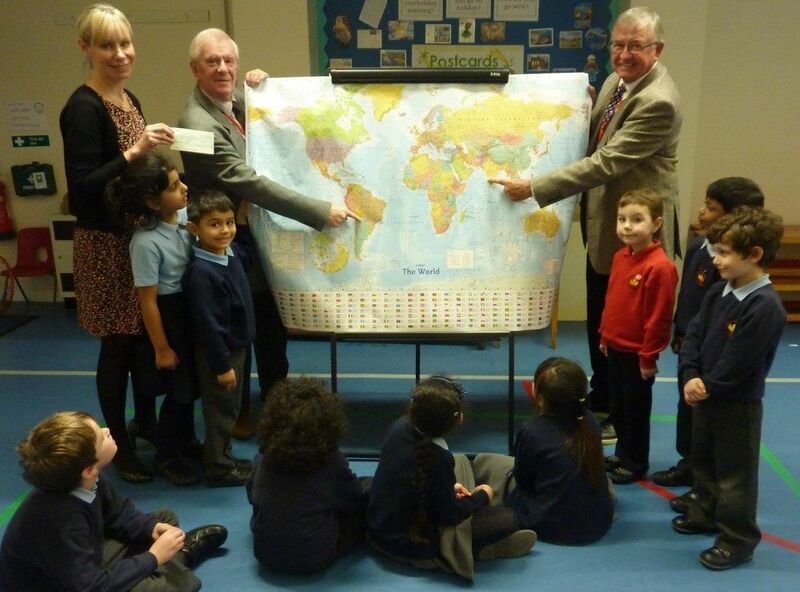 This followed a recent visit to the school by members of the Rotary Club of Gravesend who told the children about the Shelterbox scheme which provides help for disaster victims who have lost everything. Last year Shelterboxes were sent to 26 areas world wide and since the scheme started 13 years ago over 160,000 families have been helped in 270 different disaster areas. The Head teacher of Wrotham Road School Mrs Green is pictured on the left with the Shelterbox cheque and when thanking the children for their contribution the President of the Rotary club John Baker (on the left of the world map) said that “once again the children of Gravesham have shown how generous and kind hearted they are to others less fortunate than themselves. Somewhere a family who had nothing and no hope, now have a safe place to sleep and the tools to help them make a new life…all thanks to the children of Wrotham Road”. Just before Christmas, the three local Rotary clubs of Gravesend, Gravesend & Meopham and Northfleet with Ebbsfleet celebrated the centenary of Rotary International of Britain & Ireland. The presidents of the three clubs meet in Camer Park and (with the help of Gravesham Council staff) planted a young tree to commemorate the event. Now some six weeks later, the young tree in its protective structure and with it’s Rotary plaque is beginning to establish itself amongst the other trees in the park. When the bleak snows of winter currently seen are replaced by the growing warmth of the sun as spring approaches, the blossoming glory of the parks latest addition will be there for all the park visitors to see.